Milwaukee – Milwaukee’s iconic Five O’Clock Steakhouse welcomed several notable visitors for dinner this week. Wayne Larivee “Voice of the Green Bay Packers” dined with colleagues from WTMJ Newsradio 620. Renowned video producer, director and cinematographer Wes Teshome was in town working on a new project. Teshome is known for his work with pop singers Ed Sheeran and Jojo, plus bands such as Skillet and Dream Theater. Kostas Angeloudis, Taso Pardalis, Nikolas Katsimpras, and Panos Satzoglou from Cosmos FM 91.5 Hellenic Public Radio in New York dined while in town to interview Giannis Antetokounmpo of the Milwaukee Bucks in advance of the NBA All-Star Game. Award-winning journalist/anchor George Mallet of WTMJ4-TV Milwaukee and Kat Froelich, weekend host on 88.9 Radio Milwaukee took a break from their on-air duties to dine at the steakhouse Saturday evening. 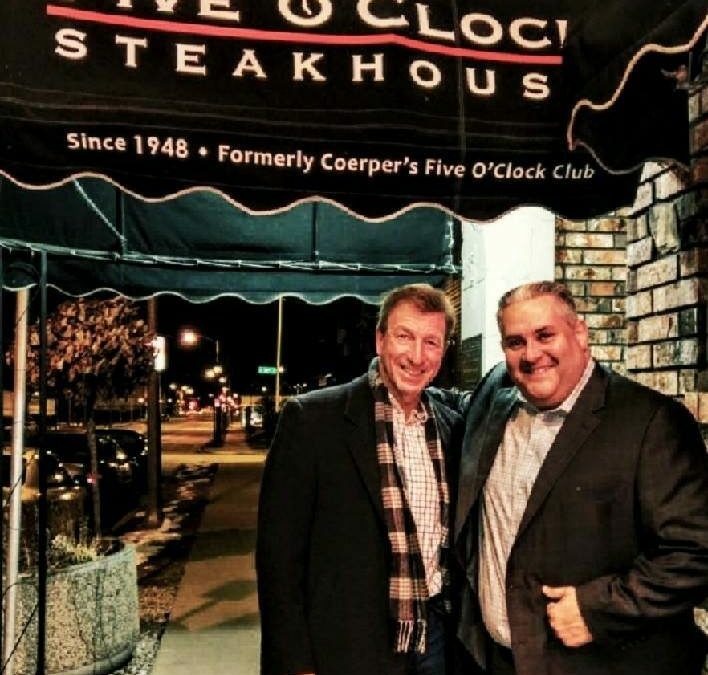 Five O’ Clock Steakhouse, formerly Coerper’s Five O’ Clock Club, has been a family-owned and independently operated Milwaukee staple since 1946, serving the finest steaks paired with outstanding service. Five O’Clock has been named “One of America’s Best Steakhouses” by TV host Rachael Ray, TravelandLeisure.com and was featured on the Travel Channel’s “Steak Paradise 3.” The Alley Cat Lounge features free live music weekly, classic cocktails and a 1940’s retro-lounge ambience.